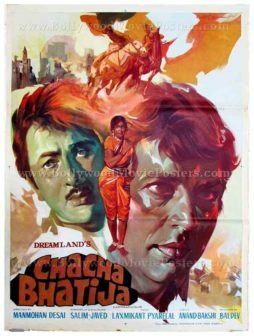 Highly collectible, hand painted vintage Bollywood poster of the Hindi film Chacha Bhatija (1977) for sale. This is an actual surviving poster of the 1977 film that starred real life couple, He-man Dharmendra and dream girl Hema Malini. Printed and circulated somewhere during the first release of the film, this hand painted vintage Bollywood poster was originally designed for publicity of the film but never ended up being used. This poster was originally designed on a hand painted canvas by one of the greatest Bollywood movie poster artist of all time, Pandit Ram Kumar Sharma, making it highly collectable. The poster bears the original signature of poster artist Pandit Ram Kumar Sharma on the top right hand corner. This hand painted old Bollywood poster bears the signature traits of Ram Kumar Sharma’s fantastic compositions and spectacular brush work. Large faces of the male protagonists Dharmendra and Randhir Kapoor and depicted interwoven together, while a small figure of the actress Hema Malini appears dressed in a saree in the center. Galloping horses are show on the top against a cityscape. The typography used in the poster is completely in English. Chacha Bhatija (Uncle Nephew) is a 1977 Indian Hindi film directed by Manmohan Desai. The film stars Dharmendra, Randhir Kapoor, Hema Malini, Yogeeta Bali, Jeevan, Master Satyajeet and Sonia Sahni.